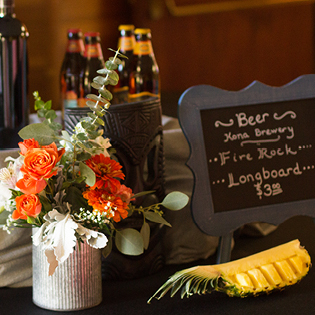 Let us bring the aloha to your special occasion, large or small, formal or informal. In addition to Noho's great food, we can provide fragrant leis, live Hawaiian music, hula dancers, and several additional menu options. We even carve whole pigs -- always the hit of the party! You can pick up the food, we can drop it off, or you can choose full service catering. The questionnaire also asks for the date of your event and the information we need to contact you. Check the box to choose one of the options below. Prices reflect customer pick up at the restaurant, and are subject to change. Please tell us later on this questionnaire if you prefer pick-up, delivery or full service catering. Most of our catering clients work with us to create their own menu. To start the discussion, check the boxes below for the main course items you'd like to serve your guests. Choices for appetizers and side dishes follow the main courses.